Ivan Rakitic’s wonderful strike against Tottenham has been voted Champions League goal of the group stage. The midfielder’s superb volley at Wembley helped to consign Spurs to defeat as Barcelona ran out eventual 4-2 winners. The goal came just before the half-hour mark. Philippe Coutinho saw his own shot blocked by Davinson Sanchez before the Brazilian then found Rakitic outside the area. Twenty-one metres from goal, the Croatian unleashed a crisply-timed strike which rocketed past Hugo Lloris before smashing into the upright and into the back of the net to make it 2-0 to the visitors. 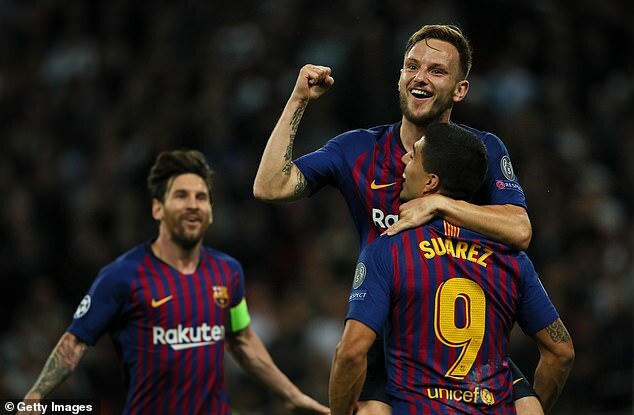 Barca went on to beat Inter Milan and draw their next two games — against Inter and Tottenham — to come out on top in Group B and advance through to the knockout stages. Tottenham recovered from that devastating loss and, thanks to a Lucas Moura goal on the final match day at the Nou Camp, will join Barca in the last 16.